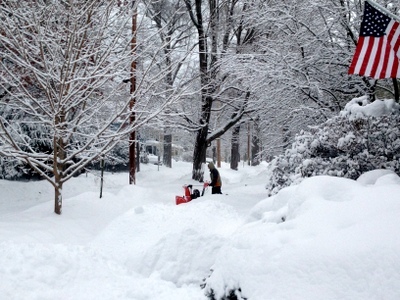 Today ends the short, snowy month of February. Tomorrow, we enter the long, long last month of winter. March is not technically the longest month of the year, but it sure feels that way. 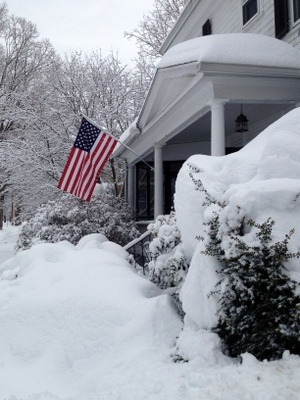 We’ve had so much snow already, and we are poised for more on Monday. The real kicker is that it’s been so unbelievably cold that we haven’t even had much opportunity to go outside and PLAY in the snow. We’ve been stuck inside, getting annoyed with each other. 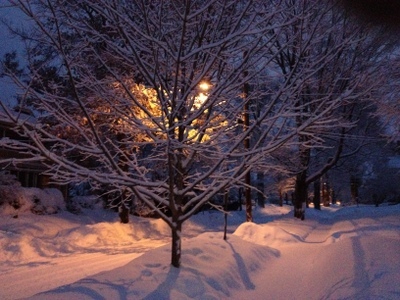 So pretty at 5 am – no one has shoveled, no plows have come by. It’s peaceful and quiet. And then you hear the blissful noise of a snow blower being started up next door by your lovely neighbor. 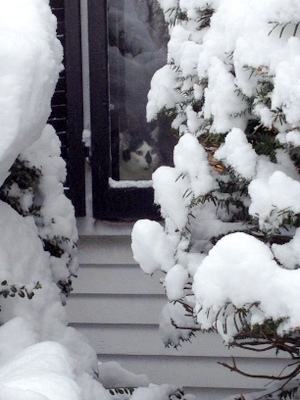 And all the while your cat is staring at you from the warm, dry indoors, laughing while you try to sweep a foot of snow off the top of the minivan. It’s not funny, kitty! This is one of my kid’s favorite stories about my childhood. The last summer that we lived in North Carolina, my parents enrolled me in a theater camp for 9 and 10 year olds. I was only 8, but they fudged my birthday to get me in. The play was about a group of people who were owned by dogs, rather than the other way around. I played Old Lady Sarah, and I was owned by a bull-dog. I wore my hair in a bun, and we colored it gray by sprinkling baby powder in it. I remember it being fun, and I still remember some of the songs from the play – Thank You Very Much (I just googled – it’s apparently a song from Scrooge: The Musical), and Me and My Shadow. So, as we’re approaching the big performance, we went on the local morning television program to sing and advertise the play. We were all lined up, and I was at the end of the first row. We sang, and then the anchor, or host, or whatever you’d call him, brought the microphone up… to me. I was, of course, terrified. Not only was I shy, and didn’t want to talk to anyone, but I was also an imposter, being an 8 year old in a camp specifically for 9 and 10 year olds! He asked my name, and I replied. Then he asked the the most dreaded question, “And how old are you?” I gulped, and said, in a half whisper, half panicked scream, “Nine!” He moved on to talk to someone else while I waited for my heart to stop racing and the room to stop spinning. When I got home that evening, my mom said that everyone at work had watched our performance, and that they all laughed and laughed when I told him that I was nine, because I was so very clearly lying. To this day, I cannot lie – my heart races, I get the nervous laughter. You can tell from a mile away that I’m not being truthful. I feel that my inability to lie is a corollary to my secret super-power: I can tell when people are lying. It’s true. Just ask my children. What’s it like to go from sea level to over 10,000 feet? 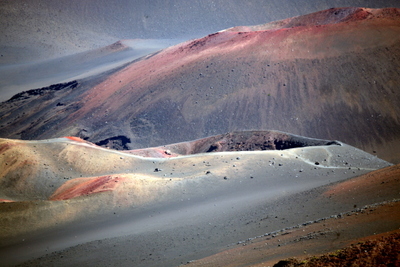 You can find out by spending an hour and half driving up Maui’s volcano – Haleakala. It’s a long, steep, winding road. On the way up, the temperature drops about 40 degrees. It was sunny and in the mid-80s at sea level. Around halfway, we passed above the level of the clouds. Now it was in the 60s. Good thing we brought sweatshirts. As we got the top, we’re looking down at clouds floating by. 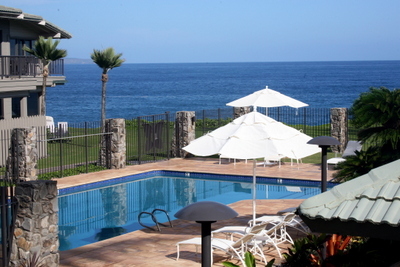 We can see the Big Island over a hundred miles away to the east, and it’s 42 degrees. Without the wind chill. Maybe we shouldn’t be wearing shorts? 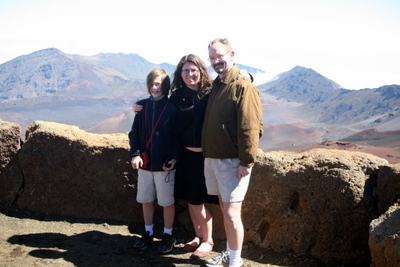 The last time this volcano erupted was sometime in the 18th century, so we weren’t in any danger. The only danger we encountered was possible frostbite! 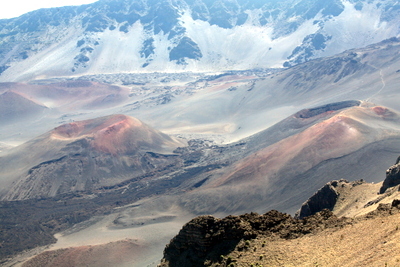 We decided to follow a quarter mile trail up to the rim so that we could look down over the entire crater. Lydia and Aaron (probably wisely!) opted to wait in the car. The wind was whistling, and at 10,000 feet there is considerably less oxygen than your body wants when you’re trudging uphill. So three frigid, trembling, huffing and puffing people made it to the top. It’s really an amazing sight, and one that’s not easy to describe. The pictures don’t really do it justice. It’s like standing on another planet. It’s so alien – couple that with the discomfort of the cold, and the lack of oxygen, and it’s really something that you should experience if you get the chance. Wear pants. And bring mittens. Oh, how I love to snorkel. 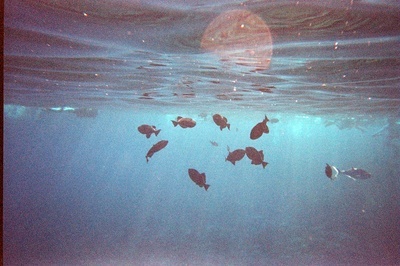 I’ve snorkeled many times, and each time has been memorable. There’s something about being in deep water, just floating along in the peace and quiet, watching the fish dart here and there. They are so graceful, and beautiful, and completely unconcerned with your presence. I just love it. 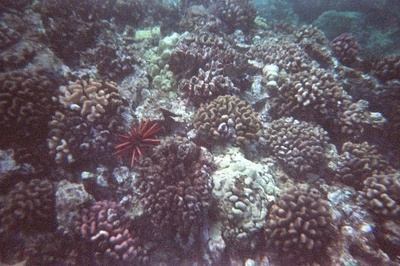 This snorkeling trip, however, was just not to be. It started out well. I had planned ahead and got a seasickness patch, hoping to avoid a repeat of the last snorkeling disaster. The water was a little choppy, as there was a storm coming in, but I seemed to fare pretty well on the way out to Molokini. 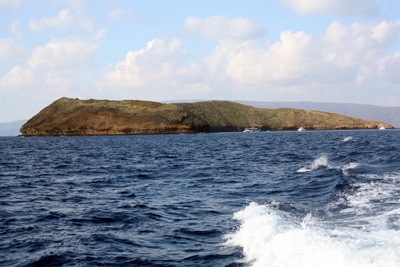 Molokini is a great spot for snorkeling. The crater lip that juts out above the waves is a wildlife refuge, so it’s completely unspoiled, and the reef around it is amazing. 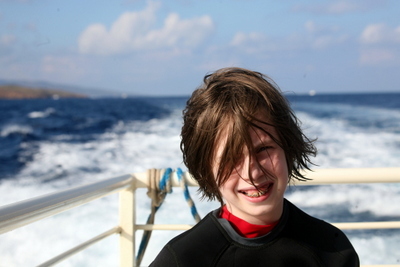 As soon as we dropped anchor, I left Nate to get the kids into their snorkeling gear so that I could get in the water. In my experience, I’ve always been less seasick in the water than on the boat. So I’m bobbing around out there, watching their progress getting gear on and working their way into the water. It took a long time, as Aaron in particular was not excited about getting in. So I’m bobbing up and down, looking at the boat, when I start to feel queasy. 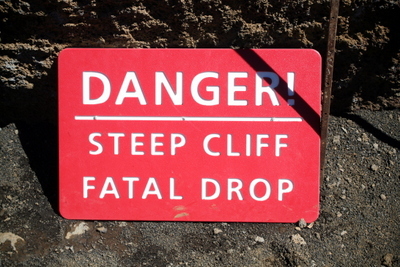 I then rapidly feel more than queasy, and I know it’s going to be Not Good. I had intentionally not eaten anything, hoping that having an empty stomach would help matters, but it turns out – not so much. So I rapidly swim away from everyone, dry heave repeatedly, and then head back toward the boat. By this time, the kids are in, Nate is in. Aaron is still unhappy, so we got him a floaty raft which I towed around for a little while. I stayed far away from people, and thus far away from fish, so that I could continue to hurl. Aaron wasn’t really into it, so we let Nate, Jake, and Lydia have fun and we went back to the boat. Aaron and I hung out on the boat (me clutching a plastic garbage bag). The snorkel trip included two snorkeling spots – at the next one, Lydia and I tried to go out for a little bit, but the current was stronger, and I was yakking more, so we gave up. Nate saw a lot, though, and Jake ended up going on a reef tour with one of the guides. He had a blast. As this is prime whale season off the coast of Maui (this is the time of year when they calve), we got to see a lot of whale action. 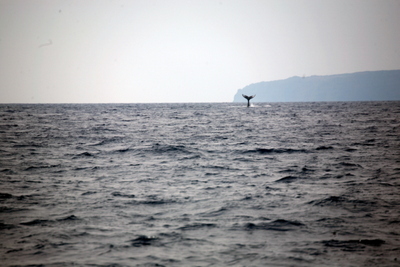 This particular whale was sticking his tail out of the water and repeatedly banging it down, making a huge splash. I’ve never seen anything like it. Personally, I feel the trip was not worth it for me, but I was happy that Nate, Jake, and Lydia got something out of it. As much as it pains me to say it, I think my snorkeling days are over. Jake loves snorkeling, and he doesn’t vomit while doing it. 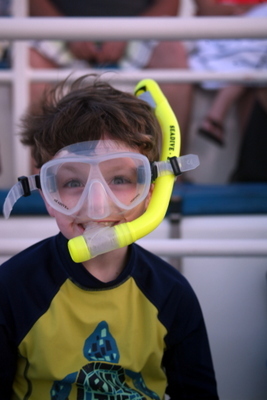 Aaron loves snorkel gear. Snorkeling? Not so much. 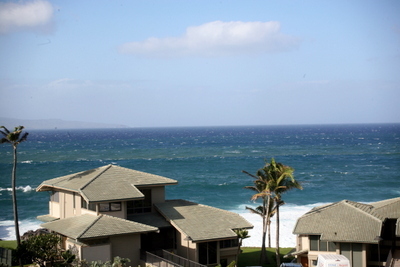 So we’ve just returned from our occasional January vacation to Hawaii. We came back to snow on the ground with more on the way, frigid, near-zero temperatures, and an immediate return to work and school. How quickly all the rest and relaxation is lost! 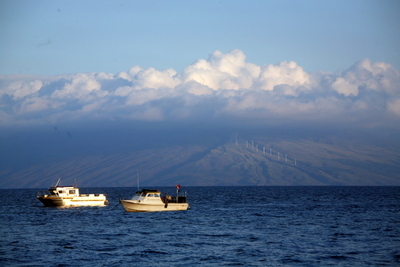 This year, we went to Maui, staying for the first time on the western portion of the island, about a half hour beyond Lahaina. It was a little out of the way, but our condo complex had several pools and a nice beach… we didn’t feel like we were missing out on anything. One of several swimming pools in the complex. 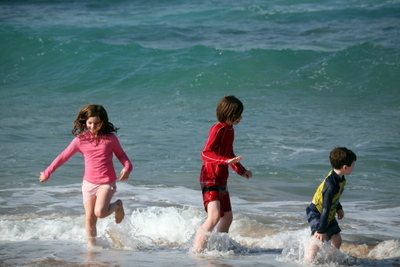 Most days we swam at the pool, then swam at the beach. Sometimes we swam at the beach, and then swam at the pool. It’s amazing how easy it is to leave regular life behind and just exist differently, as though you’ve been plucked into an alternate universe. 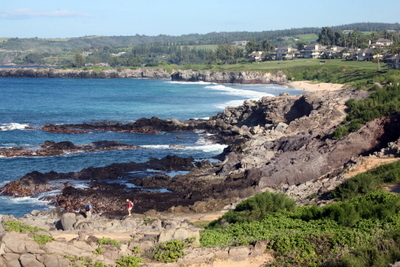 The western coastline of Maui is quite rocky, with little beaches spread here and there. There was a path along the shore that wound its way through the rocks – a great place for exploring and whale watching. Stay tuned for a few upcoming posts – snorkeling and the volcano!